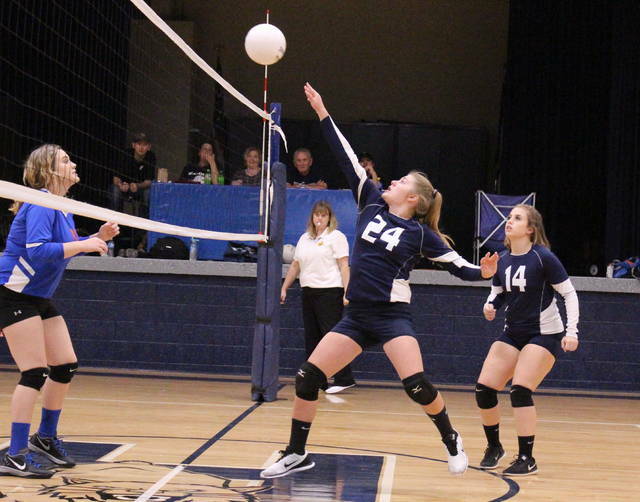 Hannan junior Pammie Ochs, middle, bumps a ball in the air during Game 1 of Tuesday night’s volleyball match against Tolsia in Ashton, W.Va.
ASHTON, W.Va. — A tough night for the Lady Cats. 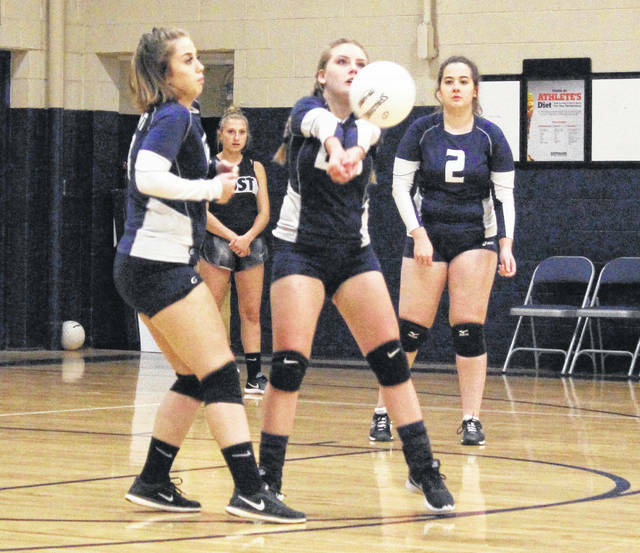 The Hannan volleyball team ultimately dropped its seventh straight decision on Tuesday night during a 25-3, 25-23, 25-8 setback to visiting Tolsia in a non-conference matchup in Mason County. 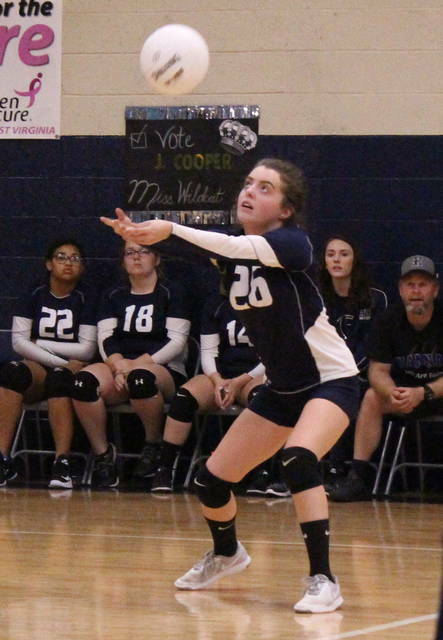 The host Lady Cats (2-12) never led in Game 1 as the Lady Rebels stormed out to early leads of 3-0, 7-1 and 11-3 before reeling off the final 14 points en route to a 22-point win and a 1-0 match edge. THS put a different group of starters on the floor in Game 2, which ended up making things a bit more interesting after both teams battled through five ties and three lead changes to end up at the two-point outcome. Tolsia opened up its biggest lead at 9-3, but HHS reeled off 10 of the next 14 points to knot things up at 13. The guests followed with a 8-4 run that led to a 21-17, edge, but the Lady Cats followed with a 6-1 surge that resulted in the hosts’ first lead of the night at 23-22. The Lady Rebels, however, broke serve for a 23-all contest, then tacked on the remaining two points to secure a 2-0 match advantage. The hosts claimed early leads of 2-0 and 3-2 in the finale, but THS countered with 22 consecutive points before Hannan broke serve for a 24-4 contest. Kassidee Bush converted four consecutive service points before Tolsia broke serve to wrap up the 17-point win and a 3-0 match outcome. Josie McCoy led the Hannan service attack with five points, followed by Bush and Baylee Hudnall with four points apiece. Pammie Ochs and Hailey White also added a point each in the setback. Hudnall led the HHS net attack with two kills, while McCoy and White each had a kill. Bush and Halie Johnson also had a block apiece for the Lady Cats. 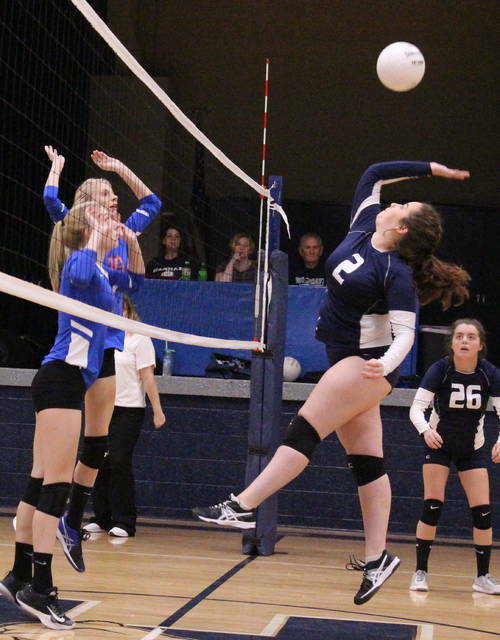 Tolsia also earned a season sweep of Hannan after claiming a 3-0 win in Fort Gay last week. The Lady Cats return to action Thursday when they travel to Huntington Saint Joseph for a 5 p.m. match.